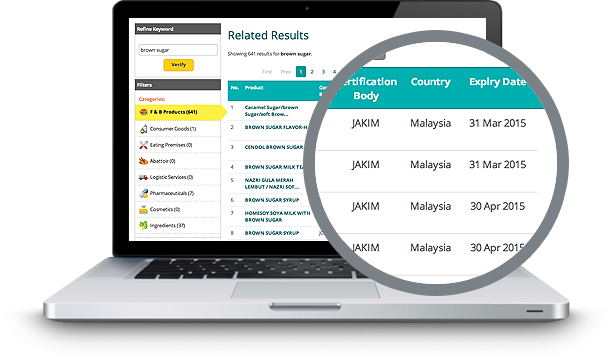 Halal Verified Engine (HVE) is a Halal certificate verification system that lets you download the Halal certificates you need, and to skip all the hassle of contacting suppliers or waiting for hard copies to arrive. Search for your suppliers or their products, view their Halal certificates, and download them. All the Halal certificates from HVE are real, trusted, and widely accepted by International Certification Bodies. When you search for ingredients and suppliers, HVE provides you with a list of similar ingredients and suppliers so that you always have a back-up solution. Once you have found the certificates you need, the only thing left is to download the certificate and you will receive the digital copy of the certificate in your email. The process to apply Halal certificate is now easier with HVE. Search, view, and download Halal certificates of your suppliers from your mobile device. Simple and affordable packages to boost your productivity. Start getting Halal certificates right now and speed up your application process.